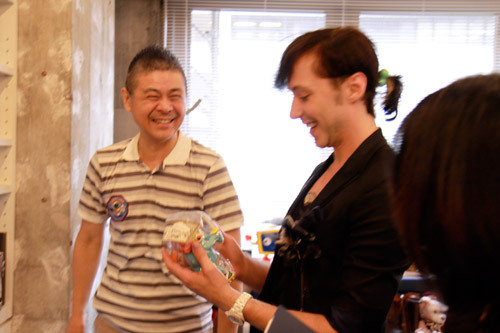 ほぼ日刊イトイ新聞-Johnny Weir!!! 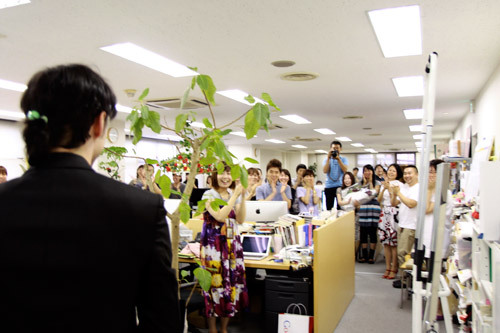 オフィスにジョニーがやってきた。 Johnny Comes to Our Office. Japan is the Beat of the World. A big day for her. Not yet. Do you want me to start shooting now? as he comes out of the elevator. So is he coming up now? He should be coming any minute, right? Yup, I just got a call that he arrived. when the elevator opens, right? Yes, they know we'll be filming. 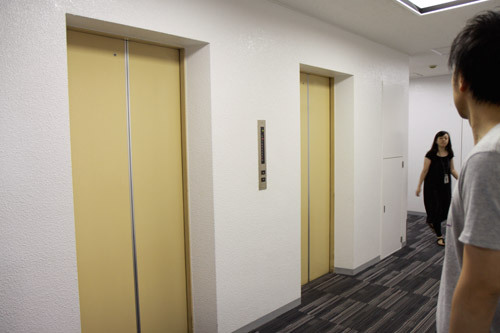 This is the elevator at the office of "Hobo Nikkan Itoi Shinbun" ("Almost Daily Itoi News", abbreviated as Hobonichi). Several crew members are waiting for someone. They seem nervous, yet excited. The anticipated visitor is a world famous figure skater. The name is Johnny Weir. Johnny G. Weir was born in Pennsylvania, USA in 1984. His first venture onto the ice occurred one harsh winter when the corn field behind his house froze over. He skated in between the frozen corn stalks with a second-hand pair of skates he received for Christmas. At twelve, his extraordinary talent was exposed at the first group lesson he attended. At thirteen, Johnny placed third at his first competition, the US championships novice division. At sixteen, he won the World Junior Championship. He won his first U.S. Championships in the 2003-2004 season, and defended two consecutive U.S. Championships that followed. Placed 5th at the 2006 Winter Olympics in Torino. Placed 6th at the 2010 Winter Olympics in Vancouver. Setting all his accomplishments aside, his extraordinary character is something no one can dismiss when speaking of Johnny Weir. With his distinctive style of fashion, his fine features that transcend the borders of gender, his exceptional atmosphere, and his distinctive pursuit of beauty, even if it's your first time watching figure skating you can't help but ask, "Who in the world is this?". Although he has won enthusiastic support from a huge group of fans, it seems that there were many officials who did not approve of him. Even then, Johnny Weir continued to polish his "Johnny Weir-ness", standing out from the rest ever more than before. When we featured the Vancouver Olympics at our web site, we received many, many e-mails from our readers about Johnny. He was so different, so beautiful, and definitely attractive. To the eyes of an amateur, his performance at the Games seemed almost perfect, but the scores were not so sweet. but he remained cool and left the rink with a smile on his face. and wrote on Hobonichi the next day. This caught the eyes of the agent who was working on Johnny's art book, and she contacted us. Through the exchange, our ideas and connections grew. Above all, Johnny showed great interest and decided to visit us. 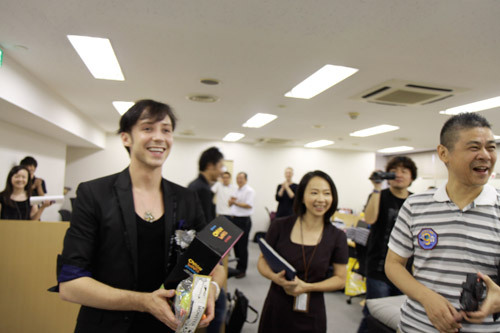 Yes, Johnny Weir, coming to Hobo Nikkan Itoi Shinbun. 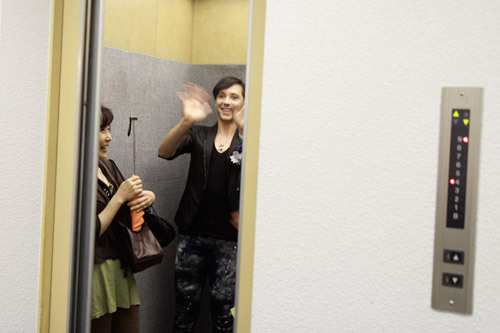 Is he in this elevator that's coming up now? 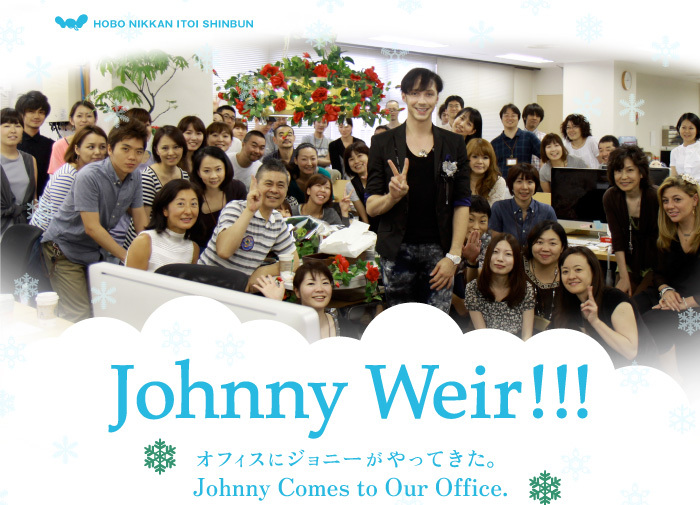 And then, Johnny really knocked the doors of our Hobonichi office. Johnny and Shigesato Itoi exchanged their deepest thoughts, their encounter becoming more than just a delightful visit, but a profound and close knit time together. So is this the elevator carrying Johnny? First he is taken to a short tour around the office. 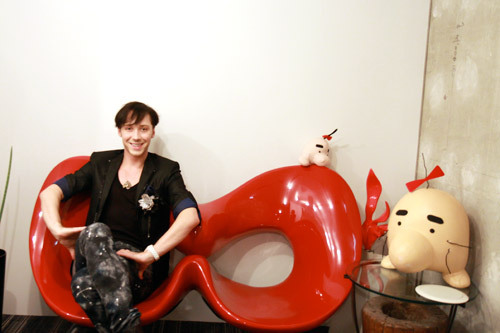 This chair is a work of Taro Okamoto. The interpreter today is our CFO, Shinoda. So he sits on the chair, with a big smile on his face. Johnny and Taro Okamoto might be the greatest combination. Oh, Mr. Saturn from the video game Earthbound is here too. What a picture! Johnny takes a look at our Japanese-style tatami room. He is glued to the hanging scroll, a work done by Woody Allen. Oh, no, no, that part of the office isn't included in the tour... Johnny walks into the room where crew members are packaging and shipping. All are surprised to meet such an unexpected guest. Sorry for all the mess, Johnny! Johnny is drawn to the work of David Lynch, another wonderful match. And so they meet! Nice to meet you! 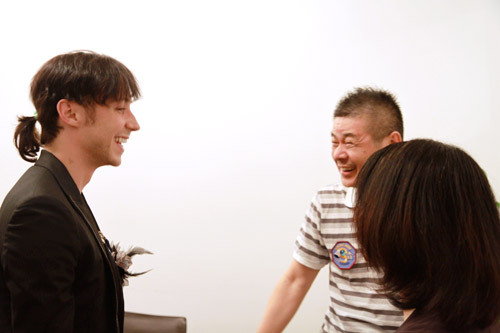 They seem to hit it off instantly, joking around through the interpreter. Curious Johnny's eyes meet the knick knacks on the shelf. "Do you like it? You can have it." And now, they head to the office where all the others await! The idea today is to have our special guest sit in the middle of where we usually work. They are all psyched! Coming up next, the interview. 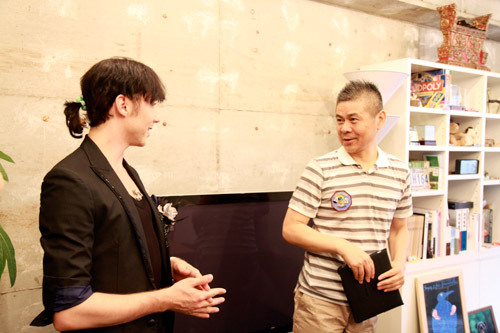 We owe it to the Team JW Art Project for connecting us with Johnny Weir,and making the interview with Shigesato Itoi happen. 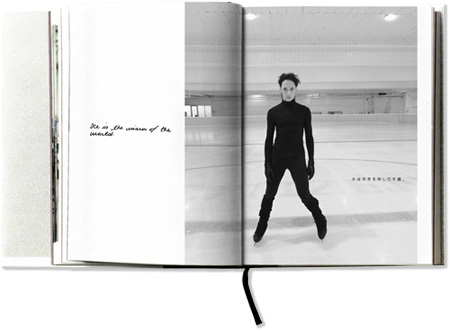 The team is excited to publish the art book “Johnny Weir”,which will include some quotes from this interview. See the website below for details.